Drawing courtesy of Wold Architects. 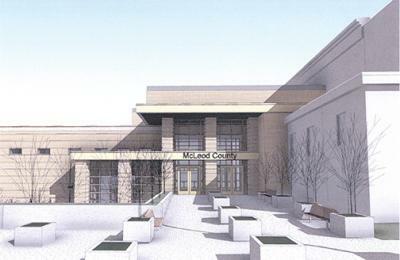 Shown above is what a new entrance into the law enforcement center and McLeod County Courthouse at the southeast side of the building may look like after the completion of a proposed $6.9 million jail expansion and courthouse security project. The County Board has seen initial footprints of the project before, but this time McNamara also presented conceptual drawings of how a new, on-grade entry way and the jail addition could look. McNamara said the original courthouse was built in 1873, with additions and improvements in the early 1900s, the 1950s and early 1980s. “The task was to try to bridge the architectural language of 1910 and the 1980s,” said McNamara of designing the outward look of the new addition. The jail addition will be built on the southeast side of the existing law enforcement center and courthouse addition, taking up about half of the small parking lot just off of 10th Street and Ives Avenue, McNamara said. The addition will mean that the entry to the courthouse on the southeast side will need to be reconfigured and enlarged. McNamara is anticipating the on-grade entry will have a plaza extending to Ives Avenue, which will be vacated and made into a driving lane into the parking area. The plaza will be dotted with planters and benches to deter vehicle traffic up to the doors, said McNamara said. “We also intend to include some type of memorial to Annamarie Tudhope,” McNamara said. Tudhope, the former Glencoe Enterprise publisher, left the bulk of her estate — about $4.8 million — to McLeod County to fund a new jail in Glencoe. That estate will help fund the new construction of the addition to the jail. For more about the jail project, see the Aug. 27 print edition of The McLeod County Chronicle.